GBM builds on over 35 years’ experience working with the community at the grassroots level. Through the Community Empowerment and Education program (CEE), community members are educated about the linkages between human activity and the environment, which empowers them to unite, take action, and stand up for their rights. 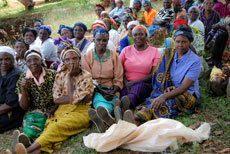 GBM promotes and enhances gender relations and involves women in decision-making processes. The CEE centers on women and community empowerment to take over leadership in their own situations. GBM’s experience shows that when the communities understand the linkage between their actions, environment and their livelihood situations (poverty, water scarcity and soil loss and food insecurity) they are more likely to muster their energies and take action for change. Through our CEE approach, we take community members through a process of understanding their environment, natural resources, identifying their problems and together, exploring sustainable solutions to these problems that affect their livelihoods. We recognize that gender inequality is a major obstacle to socio-economic and political development. Many studies have shown that gender inequality is one of the underlying causes of low productivity as it does, among other things, hamper the participation of at least half of the country’s population. In recognition of this fact, GBM has taken various measures to promote gender equality and gender equity.